Whereas chocolate peanut butter cups have long been popular in the US as has peanut butter and jelly (jam), the salty sweet combination has only recently blossomed here in the UK. Following on from the craze for salted caramel, comes chocolate combined with peanut butter and it seems to have taken the nation by storm. I’ve become rather enamoured too. The upshot of this salty sweet passion was that I leapt at an invitation to make chocolate peanut butter cups as part of a blog tour. The book being toured is the rather wonderful Homemade Memories: childhood treats with a twist by Kate Doran. For those not in the know, Kate has a fabulous blog, The Little Loaf. It’s chock full of mostly sweet treats, but with a goodly measure of breads and other savoury bakes. I’ve been following it pretty much since its inception in 2011 – we have a passion for chocolate in common after all. Kate’s photographs are stylish, her instructions both thorough and clear and her stories are always well written and captivating. Her writing style has notes of nostalgia that resonate well with me and I was pleased to see this carrying through to her book. Indeed the title homemade memories suggests just that. The book is all I was hoping for and more. It will be taking a treasured spot on my bookshelf, when I can rest it away from my bedside table that is. The photographs by Helen Cathcart are just gorgeous and make you want to dive right in and help yourself. Childhood favourites are brought to life once again, but with a slightly sophisticated yet rustic homemade charm. Most have a twist of some kind, whether it’s adding bourbon whiskey to bourbon biscuits, creating an ice-cream version of Maltesers or using healthier ingredients than you’d expect. With recipes for biscuits, cakes, pastries, puddings, ice cream, drinks and chocolates, there is something to be found for everyone, novices and experienced bakers alike. In common with pretty much everyone else who has a copy, I’ve scattered bookmarks liberally throughout. Homemade Memories: childhood treats with a twist, is published by Orion as a hardback and retails at £18.99. It is also available as an e-book for £9.99. In the chapter Midnight Feasts, I found the recipe I was looking for, chocolate peanut butter cups. Initially, I was quite keen to try them with cashew nut butter instead, as that is a firm favourite, but I reigned myself in and tried really hard to just follow the recipe. Yet again, I failed. Although I have a sweet tooth, I don’t think it’s quite as sweet as Kate’s and I ended up omitting the icing sugar and adding the honey element only. There was an option to add cocoa nibs to the mixture, but I really wanted a smooth creamy texture, so I made do with sprinkling just a few on the tops. I also came unstuck when it came to assembling the chocolates. As space in my freezer is always an issue, I deviated from the recipe by placing the peanut butter in chocolate moulds before freezing. This resulted in the discs being a little narrower and thicker than they should have been, so I ended up running out of chocolate and had to temper some more. This is why, if you look closely, you will see the chocolates are two toned. Needless to say, the result was superb and these chocolate peanut butter cups were all that I could have hoped for and knocked all of the spots off the manufactured ones. They made for an excellent birthday treat too. The chocolate was just how I like it, dark, but still with a bit of dairy in it, the honeyed peanut butter filling was smooth, unctuous and perfectly sweet enough and the cocoa nibs added an air of sophistication as well as a bit of crunch. A fabulous recipe, which if it hadn’t been for Kate, I might never have tried. Next time, and there will be a next time, I’ll try the cashew version. Honeyed salty peanut butter enrobed with dark milk chocolate and encrusted with cocoa nibs. Line a 12 hole muffin tin with paper cupcake cases or use silicone ones. Beat the peanut butter, honey, (icing sugar if using) vanilla extract and salt together in a small bowl. Divide the mixture into 12 and either roll into balls then flatten to nearly the size of the cupcake case bottoms or squash into suitably sized silicone moulds. Place on a tray lined with baking parchment (unless using a silicone mould) and freeze for 15 minutes or so whilst you get on with melting the chocolate. Either temper the chocolate according to your preferred method or following Kate's instructions or melt it using the following method. Melt the milk chocolate and half the dark chocolate gently in a bowl placed over barely simmering water, ensuring the bowl doesn't actually touch the water. Remove from the heat and add the rest of the dark chocolate. Leave to melt for a few minutes, then stir until just combined. Swirl a loaded teaspoon of chocolate around the bases of each cupcake case to cover. Place a frozen peanut butter disk on top of the chocolate. Cover with the remaining chocolate (about 2 tsp each) and tap to settle and level the chocolate. Sprinkle with a few of the crushed cocoa nibs and leave to set - about an hour depending on room temperature. Remove the cases carefully and enjoy. I am sending these chocolate peanut butter cups off to Emily at A Mummy Too of #RecipeOfTheWeek. These sweet and salty chocolate delights also go to Lucy’s last #CookBlogShare over at SuperGolden Bakes. Thanks for visiting Tin and Thyme. If you make this chocolate peanut butter cups recipe, I’d love to hear about it in the comments below or via social media. Do share a photo on social media too and use the hashtag #tinandthyme, so I can spot it. For more delicious and nutritious recipes, follow me on Twitter, Facebook, Instagram or Pinterest. Chocolate Peanut Butter Cups. PIN IT. Thanks to Orion and Kate Doran for the copy of Homemade Memories. I was not required to write a positive review and as always, all opinions are my own. Yes, a vegan version using dark chocolate and substituting the honey for another sweetener makes them accessible to all – great idea Emily. Thank you Kate. Just love your book, I’m sure it will do really well. There are so many things I want to make as well as cashew nut butter cups. Oh my, I’m a huge peanut butter fan and these look AMAZING – might have to give these a go very soon! These look so good! I absolutely love peanut butter and chocolate together so need to give these a try for sure! Have pinned! Excellent Ciara. What I’m now wondering is how did it take me so long to make some. Cashew nut butter cups seem to be a popular choice – can’t wait to try one 🙂 The book is definitely worth checking out Sarah. I love peanut butter cups! I like the idea of adding a bit of honey and cacao nibs to make it a bit different. Love it! The honey is a wonderful addition, giving a bit more flavour but also a sense of luxury. It was very tempting Lucy, but I managed to have only one on my birthday. I did, however, eat quite a lot of cake! These look great and I love the name of the book. My experiments with peanut butter started when I started my blog and slowed drastically with an allergy in the house – but I grew up with peanut butter as a savoury food and still am a bit love hate about peanut butter and sweet food. 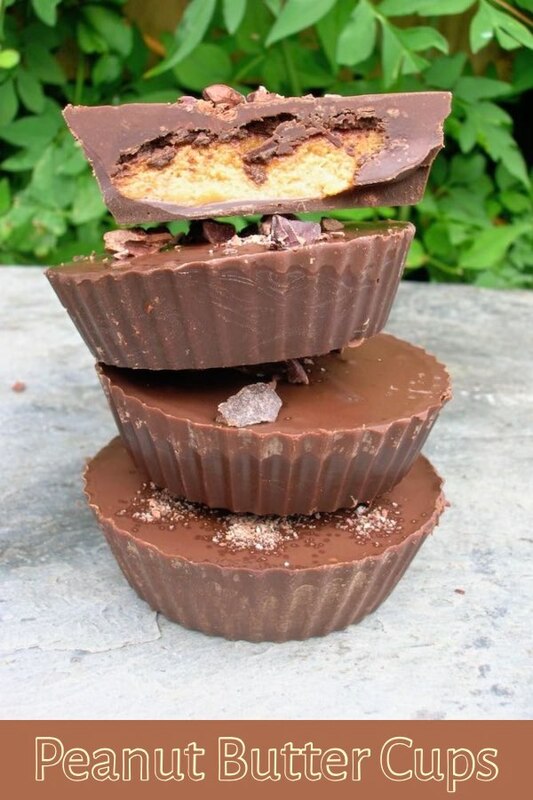 Reeses cups are too sweet for me but perhaps this modified version might work. I agree Johanna, the commercial ones are way too sweet. These were sweet enough, but not in the least bit sickly. Oh do Hayley, they would make a fab present for any peanut butter lover. It’s one worthy of taking up a bit of space on your bookshelves Jen – not that I’ve found anywhere to put it yet! omg they look delish!! really putting me in a baking mood! oh Jesus these look superb! You know I love that sweet and last thang and as for peanut butter. Oh. Yes. Please! loving catching up on your blog but my teeth hurt now! I made something similar long long time ago…now suddenly I have the craving again. These look heavenly! Ooh time to make some ultra healthy ones Angie. I shall be trying some out at some point. Oh Kate, you have me almost swooning at the though of pistachio butter cups. I’ve never tried pistachio nut butter – I wonder if the nuts work this way? Ah go for it Emily, though be warned, they are very moreish. The cocoa nibs worked really nicely on top, but they could be added to the peanut butter mix too. Thanks Merdadith. They tasted amazing too. I love chocolate peanut butter cups. These look great and the honey and darker chocolate makes them even better. YUM! Thanks Chris. These are definitely a step up from that well known PB confection. These look divine. And absolutely gorgeous for a first try! Thanks for posting 🙂 I can’t wait to try this recipe! How lovely! Homemade peanut butter cups sound amazing! These look delicious and something I could try out with the grandchildren when they visit. Great thing to do Ann. My grandmother was a great cook, but sadly I never did any cooking with her when visiting.